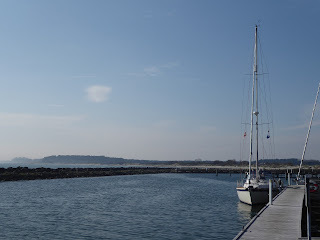 Hoping that at least we were beginning to see spring we headed back to Whileaway at her winter base at Burgstakken on Fehmarn Island, N Germany. En-route we stopped for a couple of days with our Dutch sailing friends Pieter and Riet who live close to the North Sea coast about 50km S of Rotterdam. Arriving back on the boat we worked very hard for two days. 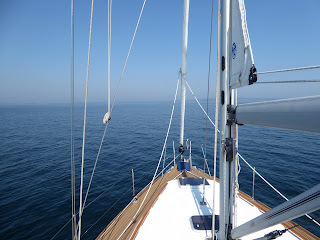 The boat was fine after her winter lay up but I had a list of maintenance and renewal jobs such reconnecting and recharging batteries, greasing various items of equipment, preparing the mast prior to restepping, etc. I discovered that the Chart Plotter (attempted repair over winter) was still not displaying properly so am unable to use it. The weather was chilly and with heavy downpours on the second morning but as Whileaway was still in the shed it didn't effect us much. Thursday was a little (chilly) windy but with sun. We were just ready for relaunch at 1100 and then began the post launch jobs the final tasks being getting both sails on, completed Friday evening. Apart from the malfunctioning chart plotter we were good to go and had favourable weather and so on Saturday 28 April we set off NE for Gedser in Denmark, around 32nm away. Of course the forecast earlier in the week had been for S winds. By the day they had changed to ENE, so were virtually on the nose. But as they were relatively light at F3 most of the time we gave the motor a work out. It was quite a sunny day albeit with a chilly wind but we arrived just before 1500LT. Gedser is a quiet Danish village, originally established when a ferry to Germany was created and nothing much changes over the years. Even on a sunny spring day there were few people around but it was noticeable that spring flowering plants and shrubs were a few weeks behind the (delayed) southern England residents! 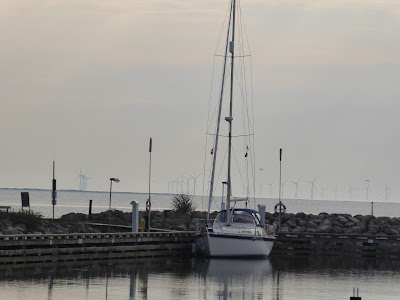 A quiet Gedser harbour, typical off shore wind farm in the distance. The next day we pushed on another 35nm in mist and hazy sun NE to Klintholm on the S of the island of Mon. There were some interesting conditions en route, at one stage we went from bright sunshine to cold fog and out again in 15 minutes. At ths stage the sea was flat with that oily surface you see in low winds. Although the chilly wind was still in evidence it was a reasonably warm. Suddenly about half way through the journey the chart plotter sprang into life! We think that it has moisture inside and the warmth of the day dried it up! But we can't rely on it working. Indeed it only worked rarely for the rest of the trip. Klintholm is another small place, quiet outside the holiday season. Nevertheless fishing boats were busy landing their catches late in the afternoon. I had an interesting chat with the HM (Harbour Master) who says that this will shortly be a base for constructing and then servicing another major wind farm due to be built in Danish waters to the NE. He said that this will be a welcome and significant addition to the limited local economy. 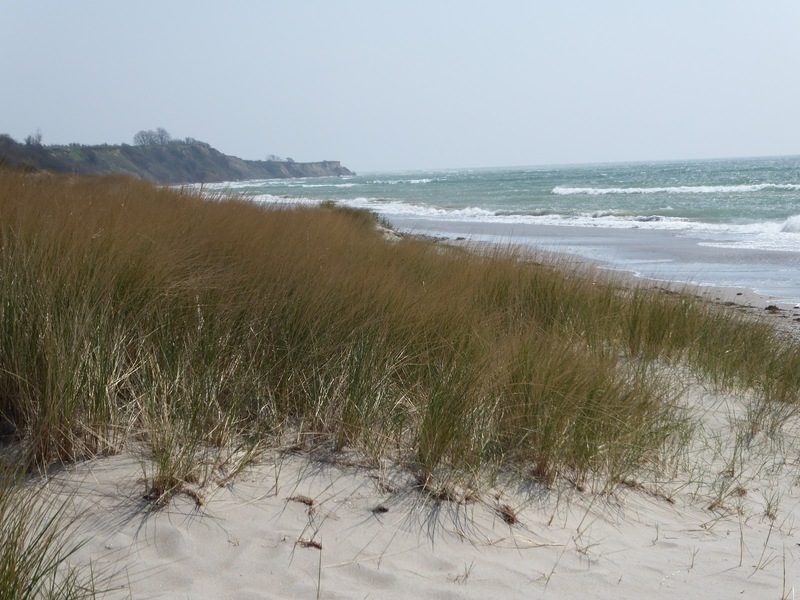 The forecast had warned us that a gale was approaching the Baltic from the UK and so we expected to be staying at Klintholm for at least a day. In the event there were two gales about 18 hours apart and so we spent two days in port. On day two we caught the bus to Mon’s main town Stege, apparently celebrating its 750th anniversary as a market town in 2018. Indeed it is one of the oldest market towns in Denmark. The town ramparts from the middle ages are still in evidence including “Molleporten” one of the best preserved town gates from the period. We have visited Stege before. 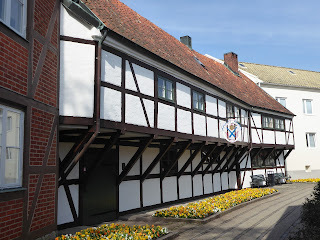 This time on the recommendation of the Tourist Information Centre we went to the Thorsvang Museum which has an amazing collection of shops, workshops, buildings and a few vehicles from the last 100 years. 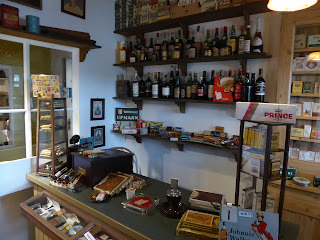 The tabacconist and off licence! 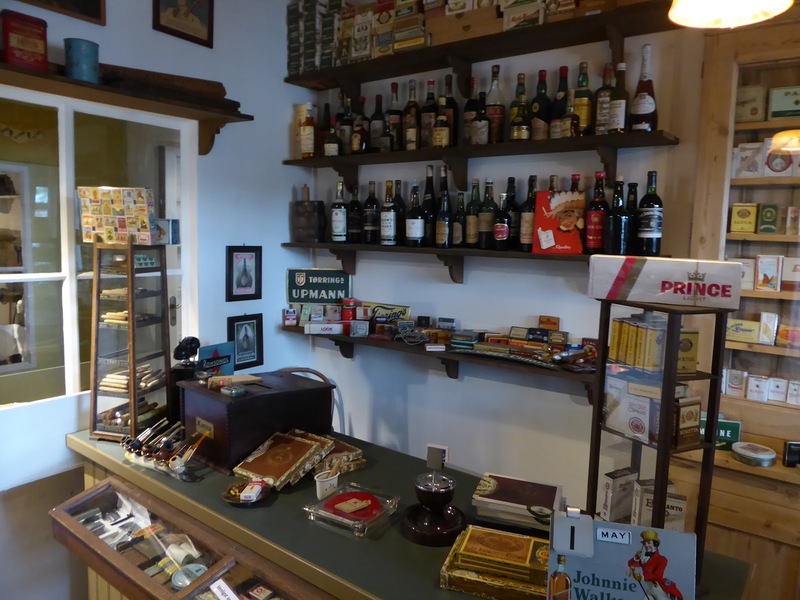 The recreated shops have plenty of historic stock much purchased as retailers in Stege and elsewhere have closed over many years. It is quite quirky. 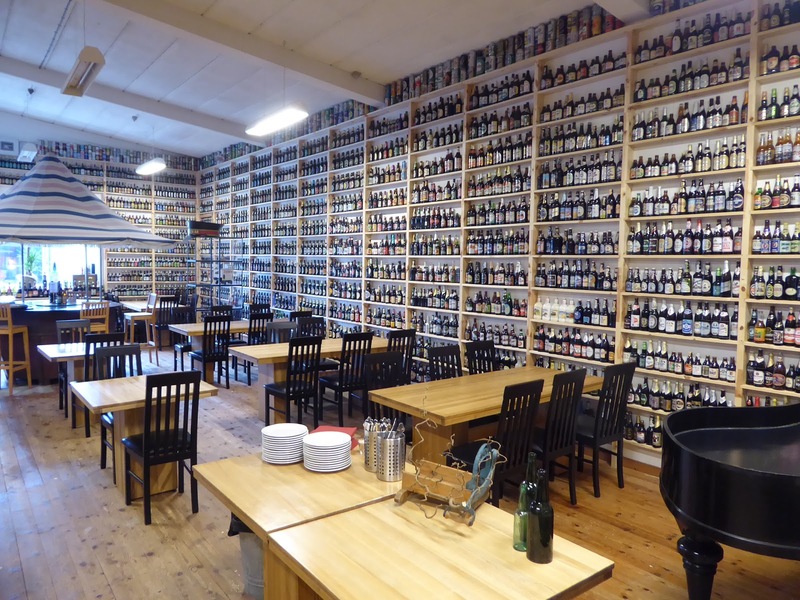 For example there is one man’s collection of 4,896 unopened bottles of beer! The storm blew through that night. From Karlskrona to our next port, Ystad in Sweden, is around 60nm, about 11 hours for us, so a helpful weather forecast is essential. As it happened we had the calm after the storm with sunshine and light E winds gently pushing us along, of necessity assisted by the engine. On this passage we cross busy shipping lanes at the foot of the Oresund and have to skirt the site of a major wind farm under construction. 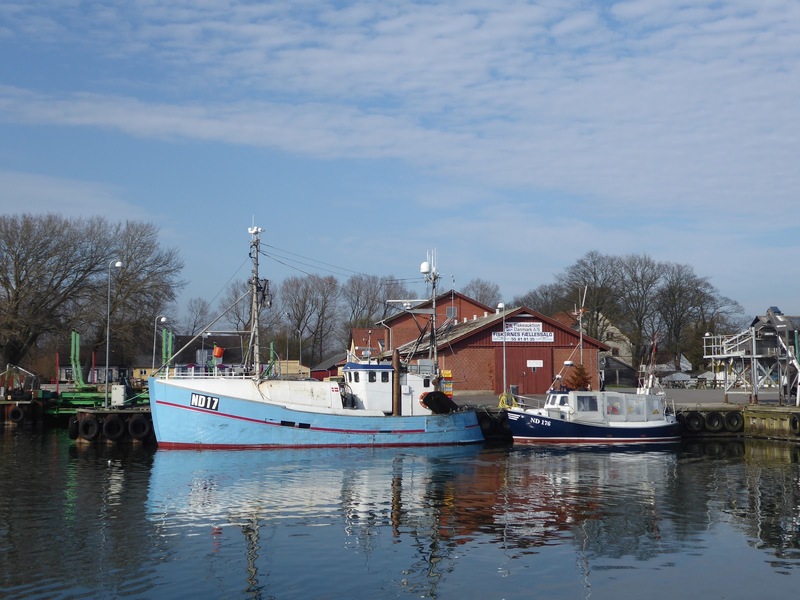 Arriving at Ystad at about 1800 we discovered that we were just one of four visiting boats in a harbour that is very busy in season. 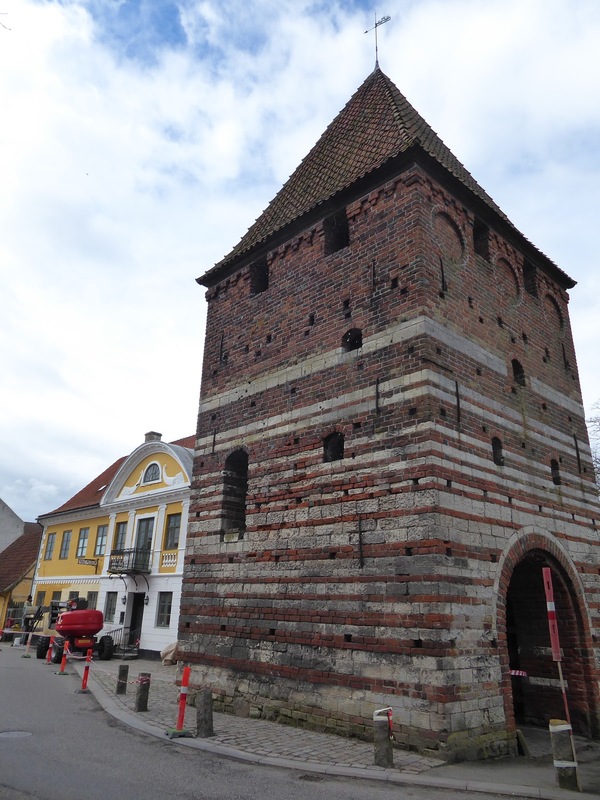 This part of Sweden was Danish until later in the seventeenth century and that is reflected in the architecture. Plenty of spring flowers in bloom planted by the municipality in all the public spaces. Yaad, just off the main shopping street. Our first bike ride took us east mainly following the long sandy beach. The weather had now begun to settle with a High building over the central Baltic. Whilst this meant dry settled weather we also had little wind, so motoring, or at best motor sailing, was required. 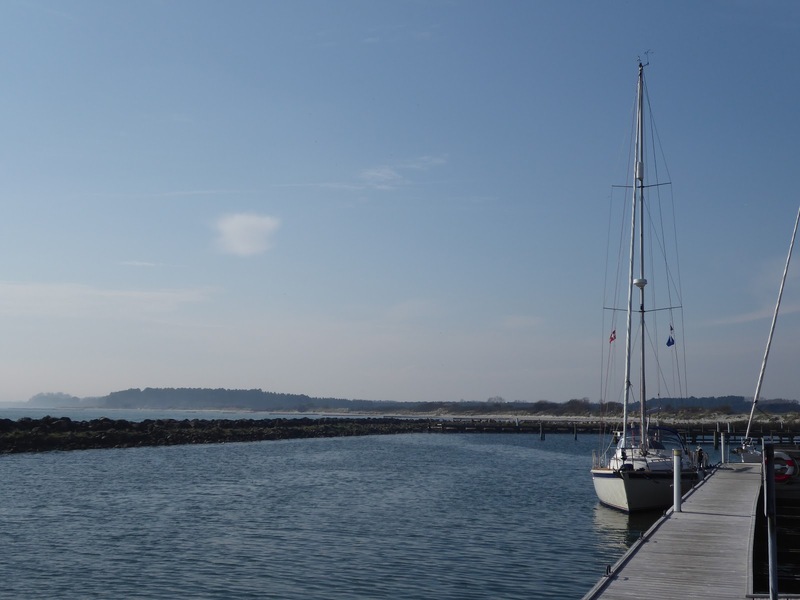 From Ystad we had two possible routes to our planned destination of Karlskrona. We opted for the slightly longer route as this would also enable us to visit two very small islands that we had not been able to get to before. 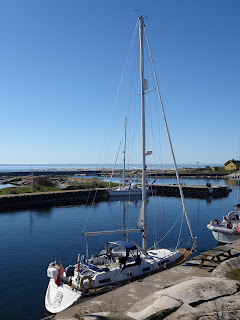 But our next port was to be Allinge on the Danish island of Bornholm. About 40nm away it is a large island between Germany and Sweden. 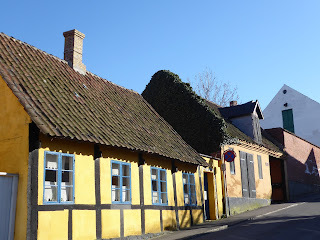 Allinge is a small attractive town on the NE tip that we had visited in 2017. 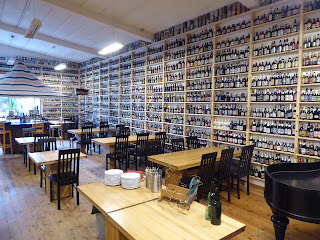 Also, it has that traditional Bornholm institution of a Rogery (Smokery) where a buffet with a wide choice of smoked and unsmoked fish, shellfish, salads and other dishes were available. On the Friday night it was packed out, buzzing with conversation. Very enjoyable. 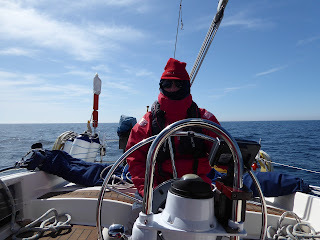 The following day we headed the short distance (just 12nm) E to Christianso and Frederikso. These two small islands are linked by a footbridge and together are about 700 metres long by about 600 metres wide. 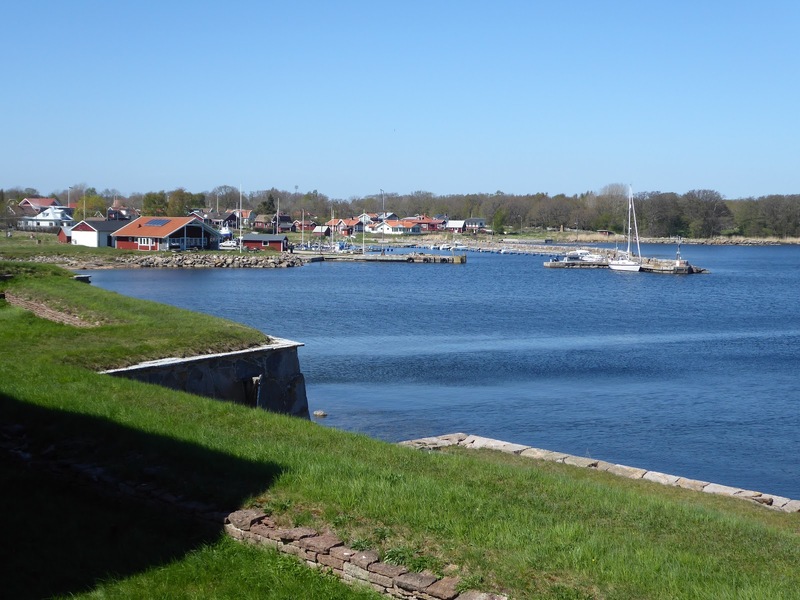 They are the inhabited parts of the Ertholmene archipelago, Denmark's most easterly land. 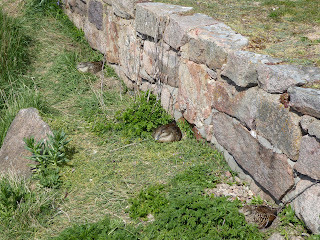 It was originally created as a fortress in 1684 for the defence of the Kingdom's interests in the Baltic Sea. 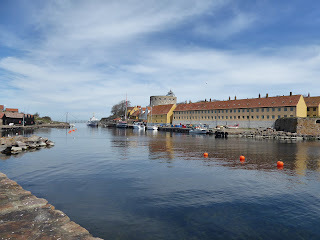 During the “English War” of 1807-14 the fortress was used as a base by Danish privateers who targetted British merchant ships bringing materials from the Baltic. So in 1808 British Naval ships undertook a violent bombardment of more than 300 bombs and 300 cannonballs in four hours! The Danish military use ceased in 1856 but the fortress walls, bastions, towers, stone huts and half timbered buildings remain and are now conserved. 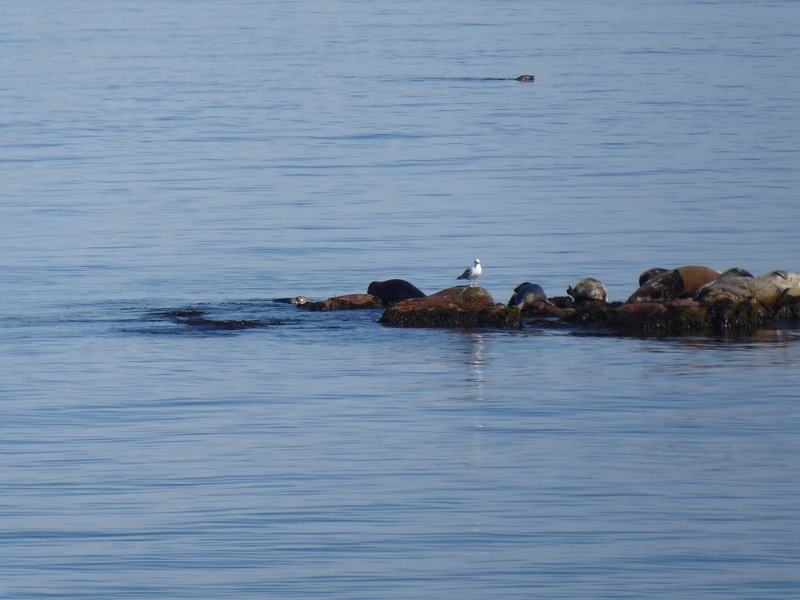 Today the islands are an internationally protected area for nature, culture and wildlife. We certainly enjoyed hearing and seeing that as we wandered around Christians and Frederikso. We were especially lucky that it was the breeding season. 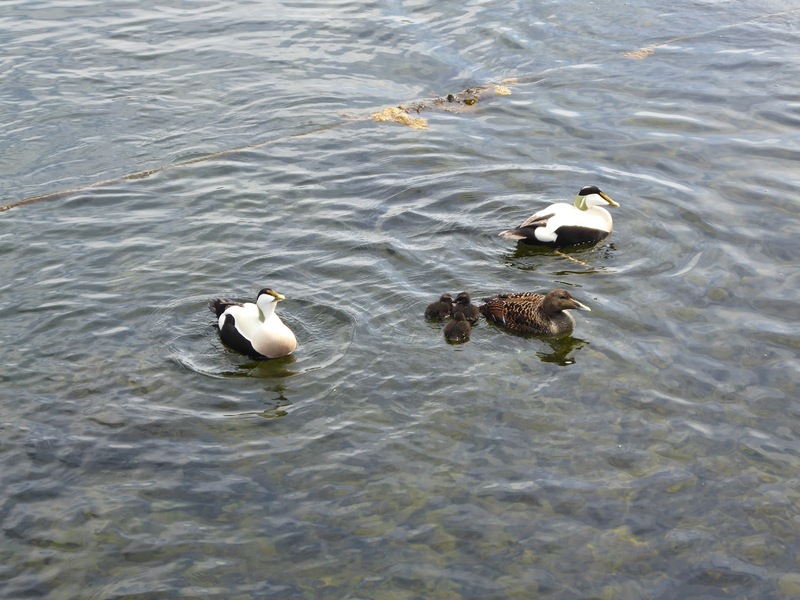 The two islands are home to over a thousand eider ducks and their nests are found everywhere even alongside paths. The birds do not feel threatened and stay on their nests just feet away as you pass by. The foot of walls are favoured nesting spots! A few ducklings had hatched and the constant calling of the male and female ducks was very entertaining. Imagine a close version of Frankie Howard saying “all no, all..ll”! 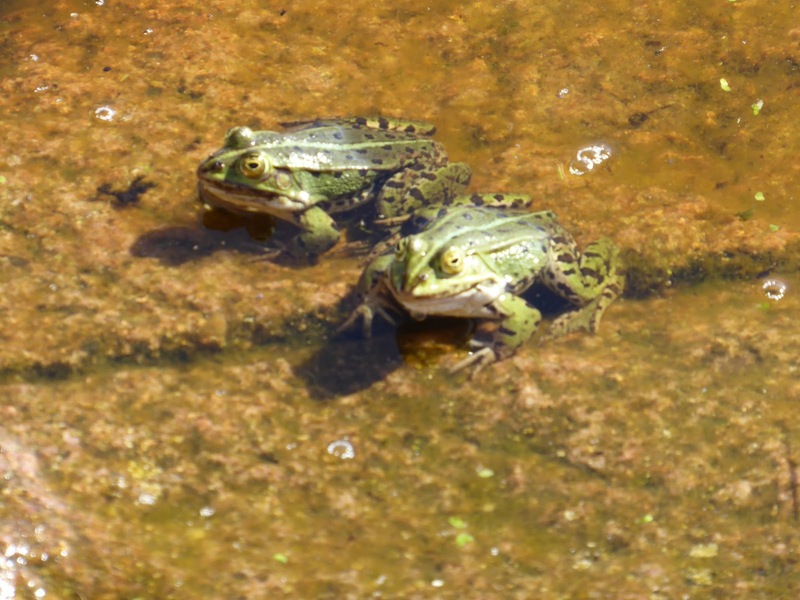 We also saw in ponds endangered species, the European Green Toad, making a terrific racket! Apparently there are other endangered amphibians on the island but we didn't spot them. Christianso can be very busy in summer; we were fortunate to get there at a quiet time. The post boat brought about 30 or 40 walkers in the morning; after they left just after lunch there were just the 90 residents and about a dozen sailors. 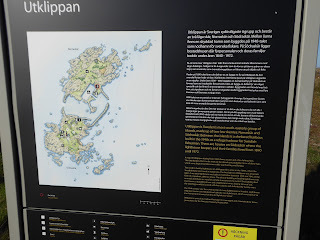 One of the boats was another Westerly “Blue Orchid”, and the two of us set off in company the following morning heading about 40nm N to the “island” of Utklippan. I put island in inverted commas as this is really just a rocky outcrop. It is about 15nm S of Karlskrona. Essentially it consists of two skerries within which a small harbour has been created. Originally a refuge for fishing boats nowadays it is only visited by leisure sailors and nature watchers. 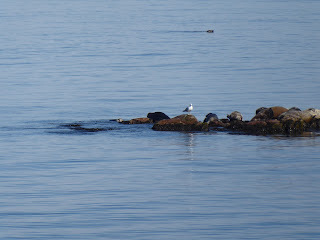 There is a lighthouse, a Harbour Master and visitors ringing birds and monitoring other wildlife such as the seal colony. At this time of the year the herring gulls are nesting and defend their territory vigorously so caution is advised! 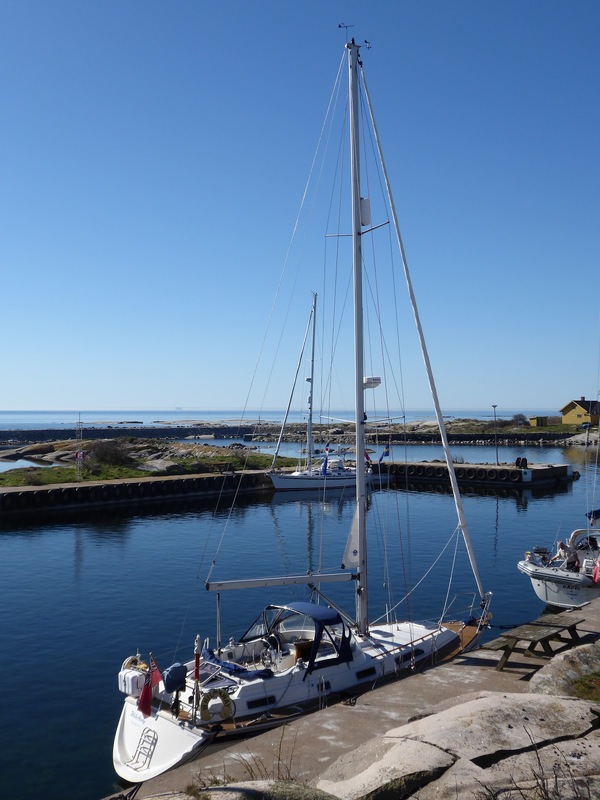 Apart from “Blue Orchid” we also met a Norwegian couple who had been with us in Christianso; and Excel of Cumbrae, another CA member, who had sailed from Karlskrona that morning. We had last met Alan on Excel when we were at Burg railway station two weeks earlier! After a quiet night the next day was to prove the warmest so far. We headed NW to the Karlskrona archipelago aiming for the small harbour of Lokanabben on the island of Aspo. 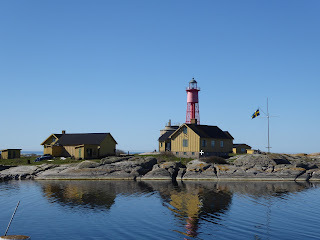 We had been to the island last year and thought that it would make a nice overnight stop before Karlskrona. Just a few hundred metres from a Citadel that guards the entrance to Karlskrona it is a lovely spot. As the season has started the Citadel cafe was open so we had a Swedish dish called Sailors Beef! A very enjoyable stew. We walked around parts of the island and then enjoyed a lovely evening with the temperature still being an amazing (for May in Sweden) 17C at 2000. On Tuesday 8 May a short motor took us to Karlskrona where, as last year, we are leaving Whileaway to return home for a few weeks. The end of our first leg of the year, just over 230nm travelled and for the last week pleasant sunny weather. After the gales our sailing was somewhat happened by light winds but the scenery and new (and old) places we visited was good compensation!